Human diseases caused by misfolded proteins known as prions are some of the most rare yet terrifying on the planet—incurable with disturbing symptoms that include dementia, personality shifts, hallucinations, and coordination problems. The most well-known of these is Creutzfeldt-Jakob disease, which can be described as the naturally occurring human equivalent of mad cow disease. Now, scientists from the Florida campus of The Scripps Research Institute (TSRI) have for the first time identified a pair of drugs already approved for human use that show anti-prion activity and, for one of them, great promise in treating these universally fatal disorders. The study, led by TSRI Professor Corinne Lasmézas and performed in collaboration with TSRI Professor Emeritus Charles Weissmann and Director of Lead Identification Peter Hodder, was published online on April 1, 2013 in PNAS. The new study used an innovative high-throughput screening technique to uncover compounds that decrease the amount of the normal form of the prion protein (PrP, which becomes distorted by the disease) at the cell surface. The scientists found two compounds that reduced PrP on cell surfaces by approximately 70 percent in the screening and follow up tests. The two compounds are already marketed as the drugs tacrolimus and astemizole. Tacrolimus is an immune suppressant widely used in organ transplantation. Tacrolimus could prove problematic as an anti-prion drug, however, because of issues that include possible neurotoxicity. However, astemizole is an antihistamine that has potential for use as an anti-prion drug. While withdrawn voluntarily from the U.S. over-the-counter market in 1999 because of rare cardiac arrhythmias when used in high doses, it has been available in generic form in more than 30 countries and has a well-established safety profile. Researchers at Papworth Hospital, the University of Cambridge, and the Wellcome Trust Sanger Institute have discovered why a new type of dangerous bacterial infection has become more common among people with cystic fibrosis (CF) around the world. Through their ground-breaking research, the team has developed new measures to protect CF patients. People with CF are prone to serious infection in part because they have sticky mucus that can clog up their lungs. In recent years, doctors have observed a global increase in the number of infections caused by the antibiotic-resistant bacterial species Mycobacterium abscessus (M. abscessus). M. abscessus is distantly related to the bacterium that causes tuberculosis and is usually found in water and soil. Until now, experts had thought it could not be passed from person to person. "There has been worldwide concern about the rising number of M. abscessus infections in people with cystic fibrosis and anxiety that spread from person to person might be responsible," said Dr. Andres Floto, Research Director of the Cystic Fibrosis Unit at Papworth Hospital, Principal Investigator at the Cambridge Institute for Medical Research, University of Cambridge, and lead author of the research published online on March 29, 2013 in The Lancet. "Our work has allowed us to lead the world in changing hospital infection control: we used state-of-the-art DNA sequencing technology to understand how the infection is being spread, which conventional techniques would have missed. Our results will help to protect patients from this serious infection." The team used the latest methods to sequence the genomes of almost 170 isolates of M. abscessus from CF patients collected over a five-year period. Researchers at the Kavli Institute for Systems Neuroscience at the Norwegian University of Science and Technology (NTNU) have developed a range of advanced techniques that enable them to identify which neurons communicate with each other at different times in the rat brain, and in doing so, create the animal’s sense of direction. Their findings have been published in the 5 April 2013 edition of Science magazine. There are cells in your brain that recognize very specific places, and have that and nothing else as their job. These cells, called “place” cells, are found in an area behind your temple called the hippocampus. While these cells must be sent information from nearby cells to do their job, so far no one has been able to determine exactly what kind of cells work with “place” cells to craft the code they create for each location. Neurons come in many different types with specialized functions. Some respond to edges and borders, others to specific locations, others act like a compass and react to which way you turn your head. “A rat's brain is the size of a grape. Inside there are about fifty million neurons that are connected together at a staggering 450 billion places,” explains Professor Edvard Moser, director of the Kavli Institute. “Inside this grape-sized brain are areas on each side that are smaller than a grape seed, where we know that memory and the sense of location reside. This is also where we find the neurons that respond to specific places, the ‘place’ cells. But from which cells do these place cells get information?” The problem is, of course, that researchers cannot simply cut open the rat brain to see which cells have had contact. Scientists have shed light on a common bleeding disorder by growing and analyzing stem cells from patients’ blood to discover the cause of the disease in individual patients. The technique may enable doctors to prescribe more effective treatments according to the defects identified in patients' cells. In the future, this approach could go much farther: these same cells could be grown, manipulated, and applied as treatments for diseases of the heart, blood, and circulation, including heart attacks and hemophilia. The new research is reported in an open-access article in the April 4, 2013 issue of the journal Blood. The study focused on von Willebrand disease (vWD), which is estimated to affect 1 in 100 people and can cause excessive, sometimes life-threatening, bleeding. vWD is caused by a deficiency of von Willebrand factor (vWF) (image), a blood component involved in making blood clot. vWF is produced by endothelial cells, which line the inside of every blood vessel in our body. Unfortunately, these cells are difficult to study because taking biopsies from patients is invasive and unpleasant. A group led by Dr. Anna Randi at the National Heart and Lung Institute, Imperial College London, used a new approach to investigate the disease. Dr. Richard Starke, a British Heart Foundation Intermediate Fellow and lead author of the study, took routine blood samples from eight patients with vWD, extracted stem cells called endothelial progenitor cells, and grew them in the lab to yield large numbers of endothelial cells. By testing these cells, the researchers were able to analyze each patient’s disease in unprecedented detail. In some patients, the scientists found new types of defect, which may enable them to recommend improved treatments. Research aimed at developing ultrasonic microphones with insect-like sensitivity is to continue in the rainforests of Colombia and Ecuador. Following the recent discovery of a previously unidentified hearing organ in the South American bush cricket’s ear, a scientist from the University of Lincoln (UK) will now study the role of this Auditory Vesicle in hearing sensitivity. Dr Fernando Montealegre-Zapata, from the University’s School of Life Sciences, aims to understand how bush crickets, also known as katydids, pick up on ultrasonic frequencies in their natural environment. The insects communicate using the highest-pitched calls in nature (130-150 kHz), which are not detected by humans. The males produce sound by rubbing their wings to attract distant females. Dr. Montealegre-Zapata said, “This animal can detect ultrasonic signals even at long distances. The problem is that at such high frequencies the sound travels in very short wavelengths which get diffracted, meaning the sound gets weaker as more obstacles are in the dispersive path. However, the bush cricket’s small ear is still able to detect this fading ultrasonic energy at long distances. I want to test how the bush crickets manage to do that in a field environment. The fluid in the katydid “cochlea,” which I named the Auditory Vesicle, is the key element in the hearing process. We want to investigate why this is the case and the first step is testing its sensitivity in their natural environment and revealing the chemical composition.” In mammals, hearing relies on three stages: an eardrum collecting sound, a middle ear impedance converter and a cochlear frequency analyzer. Dr Montealegre-Zapata recently demonstrated that the bush cricket’s ear performs these same steps in the hearing process, something previously unknown in insects. 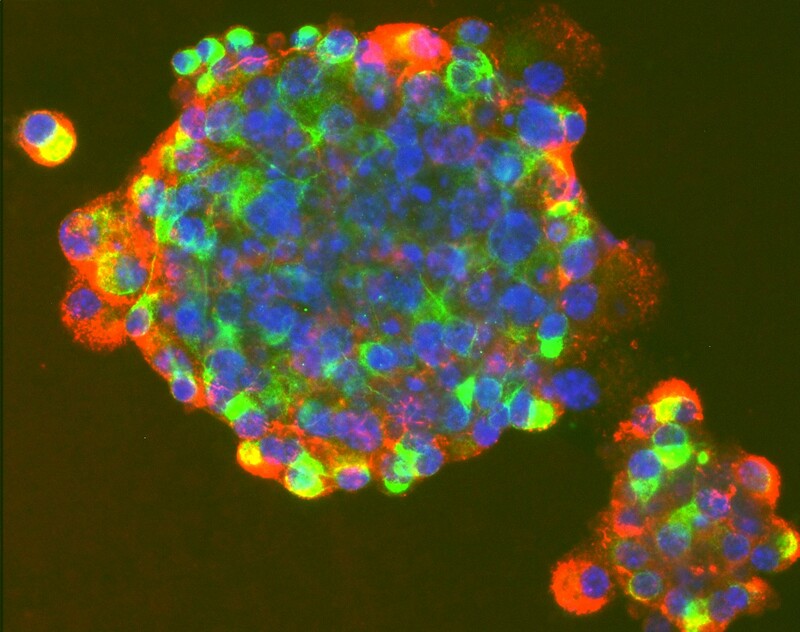 For the first time, researchers at the University of North Carolina (UNC) at Chapel Hill, together with scientists from collaborating institutions, have isolated adult stem cells from human intestinal tissue. The accomplishment provides a much-needed resource for scientists eager to uncover the true mechanisms of human stem cell biology. It also enables them to explore new tactics to treat inflammatory bowel disease or to ameliorate the side effects of chemotherapy and radiation, which often damage the gut. "Not having these cells to study has been a significant roadblock to research," said senior study author Scott T. Magness, Ph.D., assistant professor in the departments of medicine, biomedical engineering, and cell and molecular physiology at UNC. "Until now, we have not had the technology to isolate and study these stem cells – now we have to tools to start solving many of these problems." The UNC study, published online on April 4, 2013, in the journal Stem Cells, represents a leap forward for a field that for many years has had to resort to conducting experiments in cells from mice. While significant progress has been made using mouse models, differences in stem cell biology between mice and humans have kept researchers from investigating new therapeutics for human afflictions. "While the information we get from mice is good foundational mechanistic data to explain how this tissue works, there are some opportunities that we might not be able to pursue until we do similar experiments with human tissue," lead study co-author Adam D. Gracz, a graduate student in Dr. Magness's lab. Megan K. Fuller, M.D., was also co-lead author of the study.